Instant Hair Thickening Fibers are one of the easiest, non-medical solutions for dealing cosmetically with thinning hair, and minor hair loss. Previously, the only solutions to cosmetically handling thin hair were messy sprays, lotions, and powders. With the introduction of natural keratin protein fibers that simply adhere to existing hair, it’s now possible to attend functions and public events with a fuller-looking head of hair. Dr. Robert Jones of Toronto, Canada, has been working on the ideal formula for Instant Hair and has made another step forward in the technology. The new formula applies more evenly and provides a more natural effect. The transformation looks so real that the product fibers are virtually undetectable to the human eye. Users report the product makes them feel younger, revitalized and more self-confident. Instant Hair is easily applied by shaking the container of colour-matched hair fibers over your thinning area. The product is made from keratin protein fibers that are charged with static electricity, to stay in place on the head even in strong winds and hard rain. Instant Hair natural hair fiber is available at http://www.InstantHair.com. All customers who purchase two bottles of Instant Hair will receive two units free, and also receive free shipping. 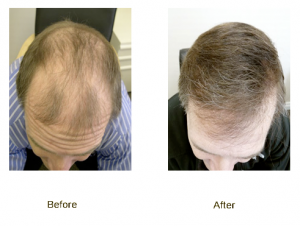 Dr. Jones is a physician dedicated to full time hair transplantation, providing state-of-the-art hair transplants at his Toronto Hair Transplant Center. He is a member of the International Society of Hair Restoration Surgeons (ISHRS), is a Diplomat of the American Board of Hair restoration (ABHRS), and is featured on many hair transplant networks, websites and the television series Skin Deep. Instant Hair is a complex of tiny, micro-fiber “hairs” that blend with your own hair, creating a thicker and natural appearance in under 30 seconds. Enjoy the confidence of a full head of hair from the very first time you use Dr. Jones Instant Hair Thickening Fibers.